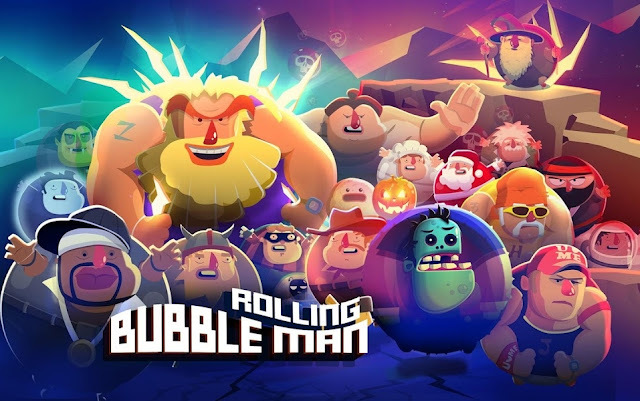 Bubble Man: Rolling - The super addictive new game from the creators of Bubble Man: Rises. Bubble Man is featuring a fun and challenging game which is impossible to let go! Roll over the roof with your favorite characters: Bubble man Be Like Bill, Santa, Ninja, Viking, Pirate, Cowboy, Witch, Ronaldo, Zombie, Sumo,Astronaut, PewDiePie, Alien, Dracula, and so many more. Master the climb, unlock all the characters and share your highest score with your friends! Do you want your favorite characters in the game? Find out more in our website or Facebook! • Lots of Different characters plus Different Handmade Environment! • Roll Over the Neighbor’s Roof, Dodge the Birds and Eat Burgers! • Smash the Boxes and Find Big Burger! • Use Power Up to Boost Your Score! • Win New Characters, Everyday, For FREE! • Collect Power Ups to Boost your Record! • Update the game for more character! Fun, Challenging and Addictive, All in One! Relax and make sure you tab at the right time! Bubble Man: Rolling: install APK and play the game.